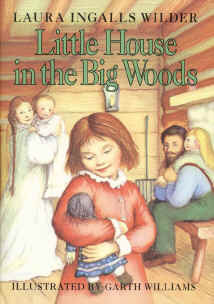 I've been reading The Little House in the Big Woods to the boys as our bedtime story for a week or so now. They love the stories and have asked each night to read more about "Laura & Mary". I had picked up one of the Magic Treehouse books from the library (we previously read books 1 & 2 from the series on our cruise) because I wasn't sure how interested they'd be - but they have chosen "Laura & Mary" over "Jack & Annie" every night so far. We have a few of the shorter, picture books that were written for preschoolers and they have enjoyed those. C has been excited to recognize the stories in the bigger book from those short excerpts we read earlier. He is also very interested in the fact that it is a "true" story, versus an imagined one. I always loved this series, and am excited that my boys think it's fun to listen to. I see that Amazon has a CD of music that was created from the songs played by Pa in the books, and I plan to buy it when we have a few extra dollars. While we still read picture books, I'm glad they're both old enough to listen to stories that are mostly words. They're excited to see the few pictures that are included in the book, but they're perfectly content to snuggle next to me and listen. I devoured the LHOTP books when I was younger!